One trend that is huge right now is the peplum trend. Here's your history lesson for the day- Peplum originates in the Greek word for 'tunic' and can be described as: a short over-skirt that is usually attached to a fitted jacket, blouse or dress. Last Sunday and Monday while attending the Lucky FABB events I have to admit I was not shocked by the amount of peplum shirts I saw. It's a fun trend to try and can even disguise your belly. Which, I'll admit, I needed after indulging myself in one too many In-N-Out meals. 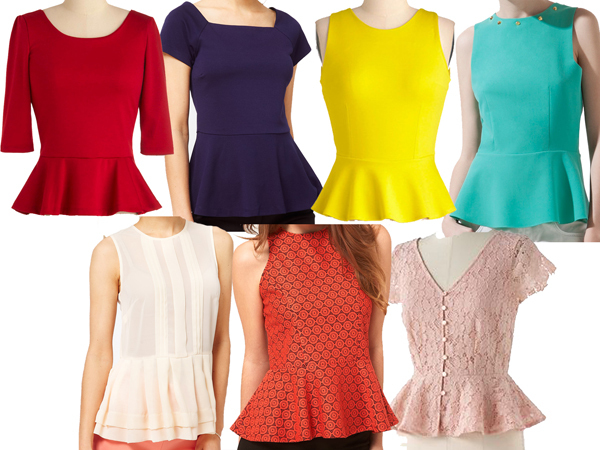 I've been on the hunt for a fun peplum top with either fun design or a bright color. Here are my top contenders-all under $60. How do you feel about the peplum trend? Will you be wearing it this season? Glad they restocked it for you! That is one of my favorites. I will surely wear the peplum this summer!